We only use high quality 100% acid-free 1.4 microns thick mountboard. 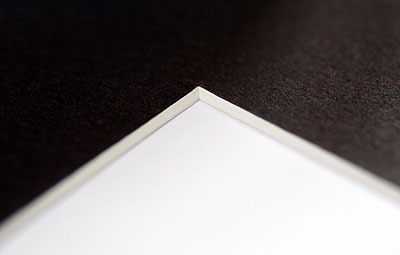 Conservation standard mountboard, ensuring no leaks or degradation of your artwork. Each board is alkaline-sized, acid-free and calcium carbonate buffered for enhanced durability and longevity. All our mounts are precision cut every time and can be cut exactly to your specifications. We cater for low and high volume orders. Any order over £120 has free shipping . We offer mounts of every type, style and colour. The prices are great to. All mounts fully comply to FATG (Fine Art Trade Guild) Conservation level. They also pass the Silver Tarnish Test and Photographic Activity Test. There are 3 types of Photo Mounts we make. 'Singles' a single layer mount. 'Doubles' 2 mounts layered on top of each other but are offset , different colours. The colours used usually match the main artwork colour. 'Extra Thick' mounts - a single layer mount that deeper that a single layered mount. Whichever one you choose - they will all look great. We cut ALL our mounts so they have a unique 45° angle - you will notice the difference. Most other mounts you find online will only have a 40degree cut - that's why our are different.